Lets take a simple example of a disk (a filled in circle) which is just black against a white background. To render it we just need to set each pixel to black which is inside the circle right? You can see that the left disk looks better than the right disk, it is in fact the best rendering for this piece of geometry. 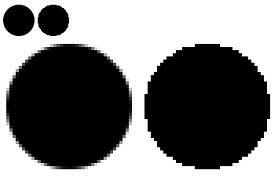 The blackness is proportional to the area of the pixel that is inside the set. This is in fact how most 2d geometry is rendered, for more complicated shapes it is usually achieved by supersampling, which means testing multiple points inside each pixel (e.g. a 4x4 grid of points) and averaging. This is an approximation of the ideal render since it is an approximation of the area under the pixel that is in the set. It gets closer to perfect as you increase the number of supersamples. And that's where most rasterisers leave the issue of rastering. But there's a problem, how do you raster a line? You can't calculate the area under a pixel that contains the line because lines don't have area. You could solve the problem by saying that such 'thin' lines are invisible and so you render lines only by giving them a certain width. However this requires choosing a width and it is altering the object to a different shape. We should be entitled to see lines and points and other mathematical objects on our screen, even if they have no area. Fine, but what about points? Points neither have area or length. The ideal rasteriser would darken each pixel based on the number of points under the pixel. And what about rough objects like the Koch curve, this has neither length nor area but somewhere in between, in fact it is a 1.26 dimensional object, but that value depends upon its bend angle. So rasterising geometry is starting to look very complicated.. In fact there is a single solution to all these cases, if you know the dimension of the geometry then you measure the 'amount' of geometry under each pixel in units of that dimension. So for the disk you measure the amount under the pixel in pixelWidth^2, for the line you measure the amount in pixelWidth^1, for the point the amount in pixelWidth^0 and for the Koch curve the amount in pixelWidth^1.26 etc. You then darken each pixel in proportion to this 'amount' (The Hausdorff measure). A single method for any dimensional object. 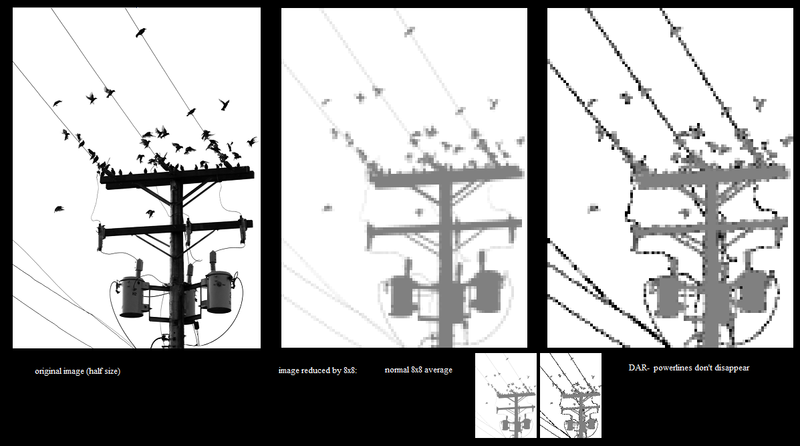 For more general shapes where the dimension isn't necessarily known or uniform we can approximate this ideal rasteriser by using supersampling. For each pixel you count the number of sub-pixels in the set at your maximum resolution (e.g. 4x4 for each pixel) c then you also count the number of sub-pixels containing the set at half that resolution (e.g. 2x2) h. The dimension is then calculated as d = log(c/h)/log(2) and the amount by which you darken the pixel is c/r^d where r is the supersample resolution, e.g. 4 in this example. The left image blackens each pixel if any of the 16x16 supersample points are in the set. It has no anti-aliasing and no smoothness even though the curves at the base should be smooth (since I'm only doing 20 Mandelbrot iterations). The right image is averaging the 16x16 supersample points, it gives smooth curves at the base which is correct, but the line areas at the top fade out and you can't even see the geometry at the very top. The centre image is using the new method. The base curves are smooth and the line areas at the top are all clearly visible as well as being anti-aliased. I am using a fractal above as an easy way to get complex geometry, but the technique can work on any black and white image. Possibly it could be extended to colour images too, as a way to retain the important information in an image when sampling to a lower resolution. Here I shade the pixels based on the dimension at that point, viewing part of the Mandelbrot set at 20 and 2000 iterations. You can see the dimension reduces (gets lighter) further up the branch. Nice. Do you have a code ? this gives a full explanation of the formulas. I don't think I still have this code but I'll let you know if I find it.